YOU MUST SELL YOUR BOOKS CHEAPLY TO MAKE ANY MONEY. 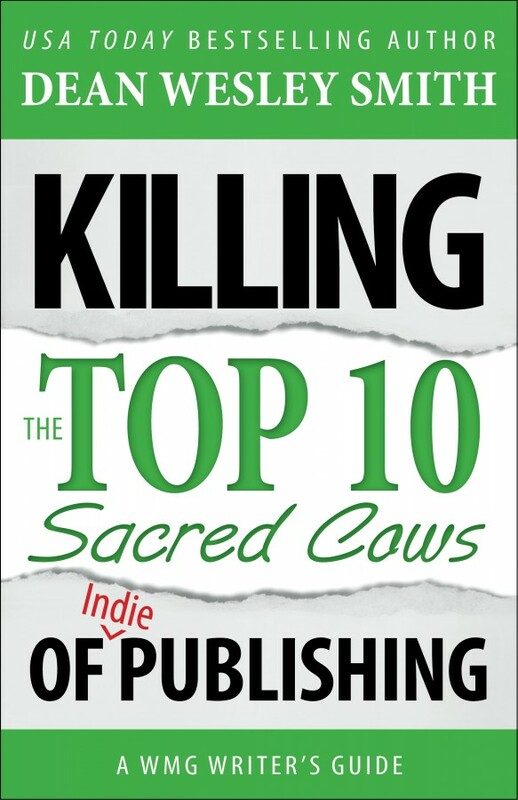 This myth is so nasty, it causes huge fights among indie writers. And the reason is that every indie writer believes they are right in their way of doing things in pricing. And yet wrong pricing, either too cheap or too expensive, can really hurt sales. So what is the right answer? What is the right price? As with so much in publishing, that depends. Back when electronic books came in, and when KDP opened up the gates to allow indie small press publishers in the door, electronic books were still a very new thing. Electronic books composed somewhere around a half of 1% of all books sold, if that. But when those gates opened, authors, for the very first time had the complete freedom to value their own work to readers. And with that freedom came some very interesting decisions. Authors had to balance value with discounts to get readers to buy in a new delivery form for fiction. First off, a bunch of traditional published writers, me included, had a sense that electronic books had less value (we were used to paper so we could be forgiven that thinking early on). So when we started into selling electronic books, we priced our books at the lowest point allowed, which was 99 cents. Joe Konrath, a traditionally published writer was the leader of this 99-cent movement. But as time wore on in that first early stage, and it looked like ebooks were here to stay and were growing in percentage of all books sold, many of us started realizing that we could price our books higher, but still lower than traditional publishers and make a ton of money and still give readers good deals. We didn’t need to toss our books into the discount bin of 99 cents just to make a few sales. In other words, readers were starting to value electronic books. After a year or so, I looked at both sides with head-shaking puzzlement. No way in hell was I going to get 35 cents for a sale of a novel (My share if I published a novel for 99 cents). I got a lot more per book in royalties than that from New York on a paperback sale. But on the flip side, there was no way in hell was I going to price a novel in electronic form at $15.99. Publishing needed a middle ground. At this point, the traditional publishers got together to break the law and hold prices high and stop allowing retailers to discount. And indie publishers were still fighting among themselves about the right low price, racing to the bottom as I liked to call it. So it seemed to a lot of us that a logical place to price a novel was in the area just under the price of a mass market paperback. (The $4.99 to $7.99 price range.) That allowed authors to get the most value for their work and allowed readers to get a deal. Eventually, the strident discount sellers in the indie world, including Joe Konrath, slowly brought their prices up. And the people running traditional publishing slowly brought some of their prices down into the $7.99 to $9.99 range for an electronic book. So now, as I write this here in the middle of 2014, pricing on electronic books, in most cases, has stabilized in a range for novels. That price range tends to be $2.99 to $9.99 for genre fiction novels, with the indie writers being on the $2.99 side (some at 99 cents still) and the traditional publishers being on the $9.99 side of the scale (some at $15.99 still). To this day, you hear the indie writers shouting about pricing in the low ranges, saying everyone needs to do that. And that low range from 99 cents to $2.99 for a full novel has become known as a discount range. But so many indie writers don’t have a clue what the word “discount” even means. And to make matters worse, new writers think their new novel has no value. What they don’t realize is if they had sold their novel to a traditional publisher, it would have sold fine at the high price range set by traditional publishers. So the beginning writers price their novel at the bottom of the scale out of sheer fear and being in a hurry to make as much as possible. For them, that first bloom of sales often quickly vanishes, or in this new world of readers becoming aware, the sales don’t happen much at all. And the new writer feels hopeless, stops writing, follows the myths of promotion, and lowers their price even more. And eventually the new writer can see no reason to write the next book because they made so little money. Because of pricing and getting in a hurry, dreams are shattered. I’m going to make this scary simple. Those of you who really understand publishing, don’t laugh. I’m trying to make this plain and clear. Discounting in the book industry comes in two forms. In this same area, there are the discount bins and tables that most indie bookstores have. Those are filled with books that didn’t sell that the bookstore owner just wants out of the way. One indie owner here in our town has a cart that wheels out onto the front area of the store and it’s full of ten-cent books. The second form of discount is what are simply called “sales.” Amazon or GooglePlay always discounts books by some percent. That’s one form of sale. Or if you have your book priced at $5.99 and put it through Bookbub for $2.99 for a short time, that’s a discount. And so on. Sales that lower a higher set price are called discounts. The problem with starting your price of your book out so low in the first form, you have no room for the second part of discounting, and your main buyers are not necessarily loyal readers, but just discount buyers. Nothing at all new about that in publishing. A fact of publishing for the last fifty-plus years. Pricing Your Book Because You Feel Insecure. Doing that is not a business strategy. That’s a wake-up call that you need a confidence boost. If you find yourself saying, “But I don’t have a name so I should give my books away to get a name.” You don’t understand anything about this business. And if you use the term, “I’m doing it to ‘get readers,’ you might want to really step back and look at your own reading habits. Do you remember an author with one book that you stumbled upon and downloaded for free a year ago? And that author had nothing else at the time published. Do you honestly remember that author’s name? And if you downloaded it for free, did you even read it? Building a fan base is one thing that is very real, AND IMPORTANT! But building a real fan base comes over a lot of years and a lot of books. Put a newsletter sign-up on your website to see how many true fans you really have at the moment. “Getting a reader” just doesn’t work in any reality, especially when they didn’t pay anything for the book. Time to do a little math just for fun. I am talking genre novels here. And I am only using Kindle pricing structure. —Your Price… 99 cents. You get 35 cents per sale. —Your Price… $1.99. You get 70 cents per sale. —Your Price… $2.99. You get $2.09 per sale. —Your Price… $3.99. You get $2.79 per sale. —Your Price… $4.99. You get $3.49 per sale. —Your Price… $5.99. You get $4.19 per sale. —Your Price… $6.99. You get $4.89 per sale. —Your Price… $7.99. You get $5.59 per sale. Now I am a business person. I know a lot of writers are not, but I am, so my concern is finding a right mix of sales vs. price to get the largest income. And this is where the fun comes in for every indie publisher. Most of us know that the 99 cent and $1.99 price for novels is just too low for anything but a short term sale of a novel. But look at that $2.99 price. You need to ask yourself this: If you set your price at $2.99, would you sell twice as many copies as you would sell at $5.99 to make basically the same amount of money? And would that sales rate sustain? That’s a decent business question and I honestly have no answer because, as I said above. It depends. FOR ME PERSONALLY, I like the $5.99 rate because it allows me to do sales along the way. I also like the $7.99 price because every sale makes a lot of nice income. And it looks better when discounted as well. And I can bundle them, lowering the price per book down and still make great money. And my books look close enough to traditional published prices as to not shout that they are not. I like having my books lumped in that area, just under the prices of traditional publishers. My books, in comparison, look like a deal compared to a $9.99 electronic book from Putnam. But not a devalued deal. But that’s just me personally. As a business person, I like the upper three prices for the reasons I stated and a number more. But again, there are no right answers. But if you don’t look at that math when making the decision, chances are you are making a wrong decision for the wrong reasons. This is a business. You have a product to sell. Each product is unique, so make the pricing decision on that, not on some myth belief that indie books must be priced low. What About Short Fiction Pricing? I personally price my short stories at $2.99 and then do a paper edition for the stand-alone story and price it at $4.99. Do I expect many people to buy a short story in paper for $4.99? No, but I like them and am using them for other things, such as signed paper bundles and so on. But the $4.99 price for a paper edition of the short story makes the $2.99 look better to the consumer and I do sell short stories at that price. Not a great deal, but some. Would I sell more at 99 cents? Sure. No doubt. Would I make more money with my short stories priced at 99 cents? Probably not. For every story I sell, I get $2.09 cents at $2.99. I would get 35 cents at 99 cents. I would need six sales at 99 cents to make about the same amount as selling one at $2.99. I can’t see that happening with short stories. Plus, to me, my stories are worth $2.99. And to hold off a bunch of questions, that price is for anything under 10,000 words. Anything. I trust my readers to know if they want to have an experience for $2.99 or not. That’s up to them. The freedom of indie publishing means you can set your own price for your own reasons. But I suggest you look at real business reasons for each pricing choice. Don’t follow me or Konrath or anyone on this. Make your own business decision. You are free to do that now. I tend to price collections electronically around the same price as a novel, maybe a little less. (Right now I am in the process of redoing my few collections and doing a bunch more.) On bundles, it flat depends. No set answer at all. Now interestingly enough, I do Smith’s Monthly, an 80,000 word “collection” magazine every month with a full short novel in it, four or five short stories, some nonfiction, and two serial novels. I sell that electronically for less than what I sell the novel for when the novel comes out as a stand-alone a few months later. My fans are slowly picking up on that and subscribing to the Monthly, which gets them an even better deal. Smith’s Monthly is good value for content and price. My short stories are set where I am comfortable and they sell a few, my novels I set in the price range just under traditional, but not much. Those are my business choices. And what is great fun, I get to make the choices. No discussion of pricing in this moment in time would be even close to complete without mentioning genre. Electronic books are major factors now in many genres, even though across all of publishing electronic books are around the 23% level of all book sales. But in some genres, that number has soared past 50% and is still climbing. And in erotica, it might be approaching 100% for all I know. And romance writers have always been fast writers, but now even they have had to pick up speed to keep their readers satisfied. So if you are writing into the romance or erotica genres, you would be better served to price down in the $2.99 to $3.99 area. And do a ton of discounting off of that. On the other side of the coin, mystery and thriller readers are paper readers, and high value readers. Electronic sales are not large yet in the mystery genre. Mystery readers will spend $8.99 for a mass market paperback or $27.99 for a hardback. There are very, very few discount mystery readers, so you would be better served to shout to the mystery readers that your books have value electronically and get the price in the $6.99 to $7.99 range. And make sure you have a paper edition as well. Genre plays into your business decisions on pricing. Never forget that. For the most part, pricing for indie publishers has settled into a range from $2.99 to $7.99 for electronic novels. Depending on a host of factors. Every publisher, every author, needs to decide for themselves how they want to present themselves to readers. Every publisher needs to understand the reality of their own genre. 1… Look at your genre and the pricing of the other books in that genre. Both traditional and indie. 2… Start your book slightly higher than you feel is right. You can do sales to give readers deals. 4… When you have four or five books in a series, but not before, think about discounting the first one down some (but not too low) to draw in readers. And do sales and special promotions on that first book to get readers into the series. That’s the time you can start using price as a really effective weapon in sales. 5… Watch what the traditional publishers are doing for electronic books in your genre at least once per year and stay just below them. That will make your book look professional, yet give readers a deal. Again, a long-term effective way to use the power of price. 6… Get a long-term business plan and stick with it. And by long term, I mean at least five years or more. At least. And most of that plan should be focused on writing, not pricing. Every indie publisher now has the choice of what to price their own books. Every indie publisher is different. This choice is a wonderful thing we now all have. But don’t let the choice drive you away from your writing. Go have fun writing the next book. Thanks for posting this great advice. I always thought the 0.99 price that others recommended was too low! I\’ve been really enjoying this series of articles so far!